The weekend of the 7th and 8th June 2014 saw a severe weather warning of heavy rain issued by the Met Office for almost the entirety of England, coupled with the Flood Forecasting Centre issuing a warning of isolated significant impacts across England and Wales. Early warnings of this weather system were available as early as the 3rd June providing the public, agencies and researchers advanced warning that flash floods may occur. With this news, the FLood Action Team (FLoAT), led out of Newcastle University, began preparing to head out to gather high quality data describing the magnitude and timing of flooding events as a result of intense rainfall. Armed with a range of instrumentation including a rain-gauge, water level sensors, Acoustic Doppler flow meter, turbidity probe and high resolution fixed cameras, the team was prepared to generate data describing the floods and flood-generating processes. 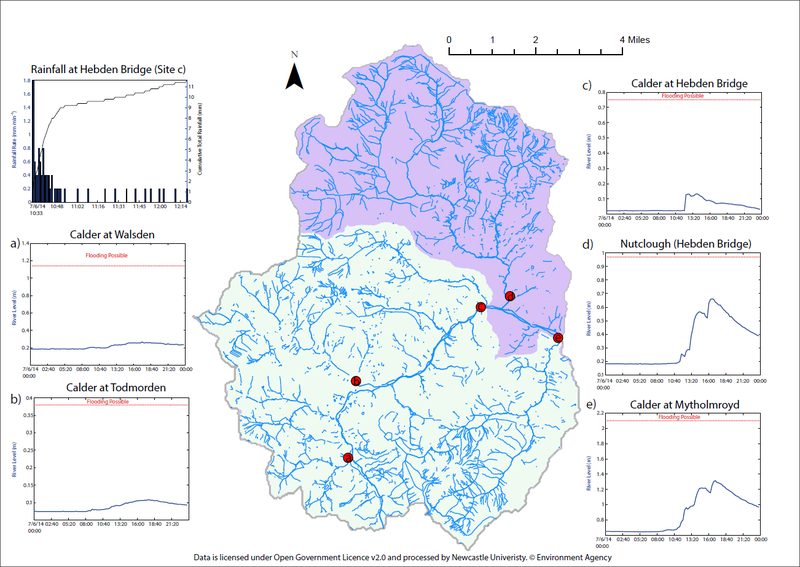 As the weather system moved into the south of England on the 7th June, the team headed south from Newcastle University guided by forecasts produced by The Met Office Global and Regional Ensemble Prediction System (MOGREPS), the Met Office Hazard Manager and real-time crowdsourcing of flooding related tweets. The team planned on intercepting the quickly moving front around the Greater Manchester area, however, based on updated forecasts the team headed to the River Calder (West Yorkshire), a Rapidly Responding Catchment (RRC), with recent history of flash flooding affecting Hebden Bridge and surrounding villages. On the 7th June, a total of 11.60mm of rain fell in Hebden Bridge (Station C) in under two hours between 10:30 and 12:20 GMT. The rainfall was localised and intense with a maximum rate of 9mm in 15 minutes. Following the onset of this event, a dampened response was observed from rivers draining the south and western parts of the catchment (Stations A and B). Whilst to the east and north of the catchment, rivers responded rapidly with a time to peak of 2 hours at Hebden Bridge, although 99% of the peak was achieved in just 15 minutes. The impacts of this event on the local communities of Todmorden, Hebden Bridge and Mytholmroyd were minimal as a result of the favourable antecedent conditions and localised nature of the rainfall combined with the speed of the weather system. This entry was posted in Uncategorized on June 19, 2014 by Rob Thompson.